How do I use the "Make-an-Offer" feature? The Make-an-Offer function can be a useful way to offer price negotiation to your customers, while still remaining competitive. Everyone likes to find a bargain, but what shoppers really like is dealing with a merchant who can be flexible with pricing when necessary. This article will instruct you on how to add the "Make-an-Offer" feature to your site, how to apply the function to a product of your choosing, and finally how it will all be presented to your customers. The first step in our process is turning on the "Make-an-Offer" function. We will do this in your account's "Store Modules" section. Using the search bar at the top, seach for "Make an Offer" to locate the module. Click on "Settings" button in this module and select "Change Settings" to set the global settings for the module. After you've configured your settings, be sure to click "Save" at the top right. Use this setting, if you'd like for the store to automatically approve the offer based on your specific parameters. Here, you will specify how long the offer stays active before expiring. Time is specified in hours. Besides approving or declining offers, you also have the ability to provide the user with a counteroffer. Use this setting to specify how long the counteroffer will be valid. Example: The minimum accepted offer does not fall below your specified price level. 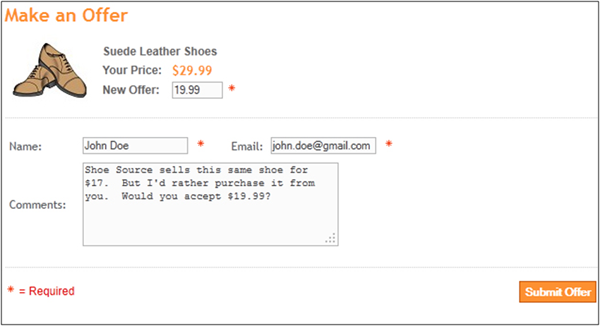 The next step in our process is to add the Make an Offer function to your products. 3dcart offers you the flexibility of having the make-an offer feature only on specific items, so the setting will need to be configured (and enabled) at the individual product levels as well. For this portion of the process, you will need to follow these steps. Same as global setting; minimum accepted offer is not below your specified percentage of the cost. 0 means it is not enabled. Enter "price_x" where "x" is the level you are using for the product's minimum acceptable. Enter the percentage amount WITH the % sign. If makeanoffer_price is left blank, the store will favor the global price setting set on the module. Once you have the module enabled, your specified products will now contain the regular "Add to Cart" button as well as a secondary "Make an Offer" button. Clicking on this button will open up a small window for your shopper where they will see the item displayed with its price and a field where they can make a new offer on the item. The pop-up window will also contain name and email address fields and a comment area for the customer to write in. Submitting the offer will trigger an email to the shopper thanking them for the offer. The shopper will now wait for the final email message. To avoid someone repeatedly entering offers in order to see how low you may be willing to go with the make an offer pricing, 3dcart has elected to place a limit on the amount of ofer bids that a user can place on items at a given time. This limit is 3 make-an-offer attempts, per item, per user IP address, per day. Again, this is done in an effort to avoid a user repeatedly placing offer bids on the item to determine how low a merchant is willing to go to sell the product. If you have the "Auto Approve" settings enabled on the module, your store will automatically send the shopper a follow-up email notifying them whether the offer was approved or declined; based on your parameters. If the offer is declined, the email will simply notify the shopper that it was declined. On the other hand, if the offer is approved, the email will contain a special link the user can use to purchase the item at the agreed upon price. If you have the "Auto Approve" settings disabled on the module, then you will need to manually determine if the offer is approved or declined. 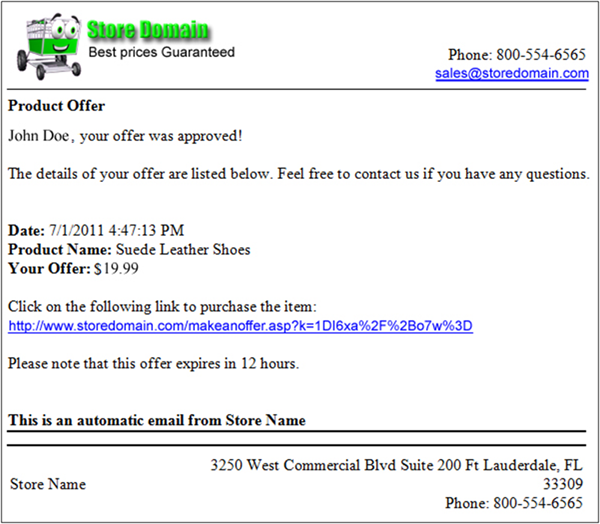 Manually approving offers can be done in the View Offers section of your Online Store Manager. This is covered in the next section. The information covered on the next section can also be used to override automated declines of an offer if desired. Locate the "Make an Offer" module and click on its Settings button to expand the selection. Click on "View Current Orders"
Alternatively, you may also click through to offers from the Change Settings page. 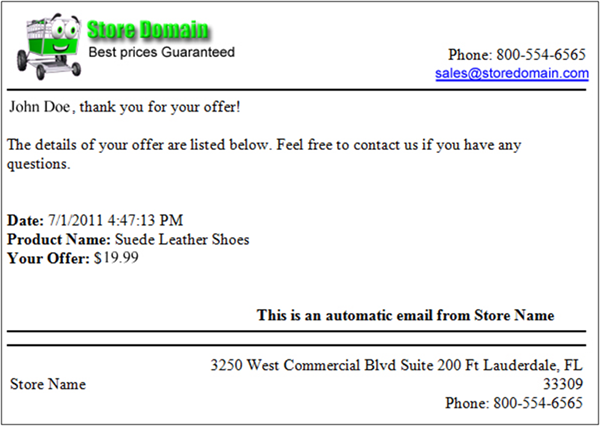 In the product offers page, you will see a listing of your site's offers. The listing will show you the product, customer's name and email, the offer they put forth and the offer's status (whether the offer was approved or declined). The "Edit" button will then allow you to manually approve or decline the offer as needed. You will also have the ability to provide the offer with a counter offer. The offer order will be listed as "pending" until the shopper actively clicks through and purchases the item within the allotted timeframe.